A Keyhole Limpet shell. They resemble little volcanoes, which is very appropriate for today. Back on Sunday morning May 18, 1980, Mount St Helens in Washington State erupted. The entire house shook with the explosion, stronger than any sonic boom I had experienced before. We lived in Eugene, approximately 150 miles south of the mountain. A morning that will remain in my mind forever. It certainly impressed me at age 10! Fortunately for our community, the major ash flow went east. We received a good coating, but nothing like Portland or other closer communities. I wonder what mountain in our area will erupt next? Wow, what an experience! 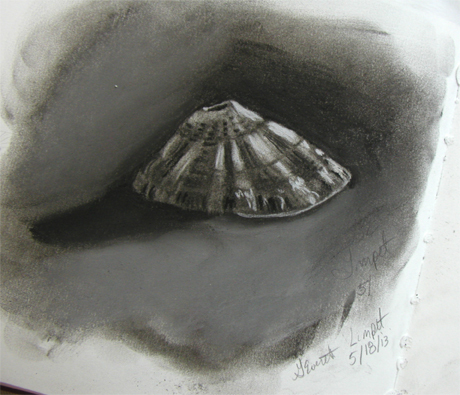 Beautiful drawing of the limpet. We got radiation from Chernobyl – that’s a long way!